US marines faced strong resistance on day four of a military push against Iraqi insurgents in Falluja. Troops continued moving into southern parts of the city, and came under heavy and sustained fire at the headquarters they have set up in the centre. Commanders insisted US-led forces were close to achieving their objectives. They said 18 marines and five Iraqi soldiers have died so far. About 600 insurgents are reported dead, but the civilian casualty figure is not clear. US officials also said 69 US troops had been wounded during the fighting. 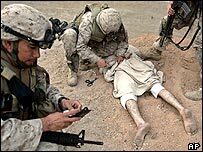 Bed capacity is reportedly being expanded at the main US military hospital in Europe - at Landstuhl in Germany - to cope with an influx of injured marines from Falluja. Earlier, two US Cobra attack helicopters were forced down by small arms fire while flying over Falluja. The crews of both were rescued. The BBC's Paul Wood, who was with marines in the heart of Falluja on Thursday, says the troops' forward headquarters was attacked from several directions with rockets and sniper fire. Insurgents attacked US armoured personnel carriers and wounded several marines, he says. One marine acknowledged to him that the insurgents had been able to regroup. But it was a sign of their weakness that they can only carry out sniper or hit-and-run grenade attacks, the soldier said. Despite the stiff resistance, US chief of staff Gen Richard Myers said on Thursday that the Falluja campaign was proving "very, very successful". In interviews on US television, Gen Myers said: "We hope that in the next few days we'll be able to return Falluja to the citizens there without the intimidation that the insurgents brought." But US officials admit the operation in Falluja will not crush the insurgency, and acknowledge many militants may have fled the city before they moved in. A car bomb in Baghdad that killed 17, as well as an armed rampage in Mosul on Thursday acted as a reminder that the insurgency is not just confined to Falluja. "I have no doubt... some people did leave before it started," said US Defense Secretary Donald Rumsfeld. "We also know that there are a number of hundreds that didn't, and have been killed. Others have been captured." Some 10,000 US forces and 2,000 Iraqi troops are involved in the battle for Falluja. Concerns are growing about the humanitarian situation in and around Falluja. Red Crescent spokeswoman Firdoos al-Ubadi said Falluja was a "disaster", with doctors unable to reach most Iraqi casualties and medical equipment virtually non-existent. Residents trapped in the battered city said they could smell the stench of decomposing bodies. US-led troops have been trying to push the rebels into a corner, by pinning them back against the natural barrier of the Euphrates river. Marines called in air strikes as they came under heavy fire in central Falluja. 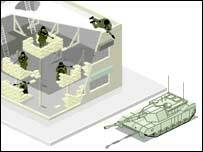 Insurgents appeared to have reached the perimeter of the headquarters they set up, the BBC's Paul Wood said. At the same time, some marines were pushing out into the city, going literally house to house to try to clear out the insurgents. Three Iraqi contractors and an Iraqi taxi-driver believed to have been held as hostages were found in a house just outside Falluja. Troops have been trying to stay inside buildings to avoid exposure to sniper fire. US-led forces said earlier on Thursday they had rid 75% of the city of insurgents in the battle. Villages to the west of the city, thought by the US to be clear of insurgents, are also reporting sniper, mortar and rocket-propelled grenade fire.